Which of Huawei's latest powerhouse phones should you be getting? If you're shopping for the best phones on the market at the moment, it won't be too long before the Huawei Mate 20 series gets on your radar – these handsets were launched in August and October 2018 and quickly became some of our favourite phones of the year. The Huawei Mate 20 Pro in particular is one of our very top picks for a smartphone in 2019, but it's also the most expensive of the three. 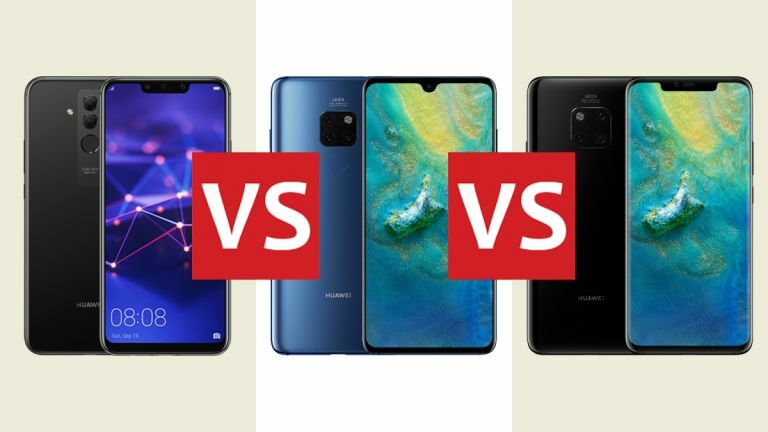 If you're shopping for a new handset this year, then which of these Mate 20 models is the one for you? We're going to help you pick. Considering all of these phones share the Mate 20 label, they're actually quite different in terms of design – or at least as different as a modern smartphone can be in 2019. In terms of size they're all very similar, though the Mate 20 Lite edges it in thinness. The Mate 20 Lite features a 6.3-inch (1,080 x 2,340 pixel) screen, and a standard rectangular notch on the top. Weighing in at 172g, it's the lightest of the bunch, perhaps one reason to pick it over the Mate 20 and the Mate 20 Pro. When it comes to colours, your choices are sapphire blue, black, or platinum gold. When it comes to the Mate 20, we've got perhaps the best-looking phone of the three, thanks to those thin bezels and that tiny teardrop notch. The notch sits at the top of a 6.53-inch (1,080 x 2,244 pixel) display, and the phone tips the scales at 188g. The colour options here are midnight blue, twilight (a funky gradient), and black. Finally the Mate 20 Pro goes back to the rectangular notch and has a 6.39-inch screen with the sharpest resolution – 1,440 x 3,120 pixels. It weighs in at 189g but to our eyes isn't quite as visually appealing as the standard Mate 20. You do have more colours to pick from though: emerald green, midnight blue, twilight, pink gold and black. As you would expect, there are significant differences in the specs of these three super-sized handsets. The Mate 20 Lite is the least powerful of the three, with the Mate 20 in the middle, and the Mate 20 Pro the most powerful (with a price to match). Let's start with the Mate 20 Lite, which has the older, mid-range Kirin 710 processor inside it, as well as 4GB or 6GB of RAM. In terms of internal storage, your only choice is 64GB, but there is a memory card slot if you want to expand that further. It'll do most phone tasks well, but it's not at the premium end of the market in terms of performance. The Mate 20 is a step up, packing the very latest Kirin 980 processor together with 4GB or 6GB of RAM depending on the configuration you go for. 128GB is the sole storage choice here but again there's a memory card slot if needed. The Mate 20 can hold its own against the best phones on the market. As for the Mate 20 Pro, it too uses the Kirin 980 CPU for the guts of the phone, but the RAM choices are 6GB or 8GB, and the storage choices are 128 GB or 256 GB – you really can trick out this handset to be very powerful indeed. Memory cards are supported too. All these phones run the very latest Android 9 Pie, with Huawei's EMUI skin on top, so there are no real software differences to speak about. However, only the Huawei Mate 20 offers wireless charging and full IP68 protection against water and dust, helping to justify the price premium. Another key difference in terms of features are the cameras. The Mate 20 Pro is top of the tree with a triple-lens 40MP+20MP+8MP rear camera, while there's a single-lens 24MP selfie camera on the front. The Mate 20 has a triple-lens rear camera as well, though the megapixel count isn't quite as high: you get a 12MP+16MP+8MP snapper on the back of the Mate 20, and a 24MP selfie camera (the same as on the Mate 20 Pro) on the front. When it comes to the Mate 20 Lite, here there's a rather modest dual-lens 20MP+2MP camera around the back of the phone. It does however have the best selfie camera – a dual-lens 24MP+2MP affair – so might be worth a look if you spend a lot of your time snapping photos with your face in them and need a wider angle to shoot with. On one level it's actually pretty easy to choose between the Huawei Mate 20 Lite, the Huawei Mate 20, and the Huawei Mate 20 Pro: you decide how much you want to spend, and make a pick accordingly. The phones go up in terms of power and features but also in terms of price, so it depends where your sweet spot is. Hopefully from the points we've covered above you can see exactly what the differences are: that high-end triple-lens camera on the back of the Mate 20 Pro, for example, or the wireless charging and waterproofing that it offers you. These features may or may not be worth the extra expense to you, depending on what you want from a phone. Check the widgets on this page for the latest prices on the Mate 20 Lite, the Mate 20, and the Mate 20 Pro – it might be that if you can get a deal on one of these phones, it's suddenly going to become more attractive than the other two. Across the board though you've got some good-quality Huawei craftsmanship on show here – all three of these phones should do you proud for several years. If you want to guard against lag and slowdown over time though, go for the Mate 20 or the Mate 20 Pro, as they carry the faster internal components.